Foreign Earned Income Exclusion vs. Foreign Tax Credit: which one is better? Is it better to use Foreign Earned Income Exclusion (FEIE) or Foreign Tax Credit (FTC) when filing US expat taxes? When the Foreign Tax Credit allows one to reduce their tax owing to zero, we usually choose it. It’s a better option compared to the Foreign Earned Income Exclusion. This ends up being the chosen treatment for our clients in Canada and Western Europe. Why? Because the tax rate in these countries is greater than the one in the United States. If this is not the case, then the Foreign Earned Income Exclusion might bring a better treatment. Why is Foreign Tax Credit a better option for US expats? The fact that after revoking the Foreign Earned Income Exclusion once cannot use it again for another 5 years (IRC 911(e)(2)). Hence, by using the Foreign Tax credit, one can revert to the FEIE. While the best outcome with the FEIE is a zero tax liability, the FTC generates carryovers for future years. Even if you are moving to a low tax country, you can use such carryovers. It can, however, only be applied against foreign sourced income. The Additional Child Tax Credit is a refundable tax credit allowing one to receive up to $2,000 per child per year (2018; it was previously $1,000 per child per year). However, you cannot claim this credit when the FEIE is used. The FTC needs to be the venue to reduce US tax. Today we prepared this easy tax infographic for you. It explains the main differences and what you need to know before choosing one of the options to save money on your tax return. Feel free to contact us regarding your tax situation and we will come back to you within 24 hours after receiving your message. Can I qualify for FEIE, or FTC if I live outside the US and am outside of the US for at least 330 days but my income of approximately $20,000.00 is reported to me on a U.S. 1099 as a self employed working from my home computer outside of the US? Yes, the reporting on a form W-2 or 1099 (or god forbid an erroneous form 1042-S) wouldn’t affect that. That said, if you can not take advantage of a social security totalization agreement, you would likely be subject to self-employment tax. This is a great site and probably the best I’ve seen regarding expat taxation. I do all my own reporting including FBAR/1040/1116/8938/8833/8965/ etc. Since retiring I now use form 1116 vs 2555 as virtually all my income is passive. It works out well. Years ago I elected not to use CDN TFSA/RESPs etc. One area that would be useful for discussion is limits of spending time in the US (more than 34 days per year) when one has no US income/property or other connections other than visiting relatives. Thank you for your feedback! We appreciate it and we will be preparing more materials to cover the topics you mentioned. I will be working overseas on a 28/28 rotation for the next 3 years. Can I qualify for the Bonafied Residence Test. Hi there, I need to file about 8 years of US returns. My only income is my salary here in NZ. How much will it cost to get this sorted? Also I’ve got 2 kids with SSNs and 2 without. Can I get a credit for this? If yes, does it carry forward or do you get cash? We replied you via email. If I moved half-way through the year (and plan on staying in my new tax home, permanently), can I claim FEIE? I have filled out form 2350 to extend the time for filing to meet the date that I moved. In this case, you can use the Physical present test but not Bona Fide Residence test. I and my wife we are leaving abroad. She is U.S citizen and I’m under immigration process. In 2017 my wife earned 48,000$ and we filled taxes and mention the same amount. But now we saw that our tax prepare added 0 (zero) as her adjusted gross income. Is it correct that even you earn more you can put 0 as your adjusted gross income while living and earning abroad. She is working abroad for last 3 years. With FATCA and CBT, the us empire, complicates things horribly. Of course, to generate $ for the tax compliance industry. I am an American and I started an online course 3 years ago while living in the United States. Now I have been living in Brazil for 11 months, can I apply for FEIE? In your case, you can claim the FEIE if you can pass the physical presence test. The physical presence test requires you to spend 330 days outside the US. I am a US citizen that has been working and living in the UK for roughly the past 8 years. I have been taking the credits all the years. I have accumulated a decent amount. I will be moving to Singapore next year. Is the best strategy in that low tax rate environment to take the FEIE? Am I able to do that, and use my tax credits for the income remaining after the FEIE amount? Essentially, am I able to utilize my credits on the US tax owed on the amount of income above the FEIE threshold? You can exclude the max amount using the FEIE and then apply FTC to the rest. If your Foreign Tax Credit exceeds the IRS calculated limit for the year, you can carry the excess forward for up to 10 years. If you do not use the carryover in 10 years, you lose the credit. The most important implication has not been mentioned: if you have no US-earned income, you may ONLY contribute to an IRA (or Roth IRA) back in the US if you use the credit; the FEIE does not allow one to do this. This fact alone makes it a no-brainer to use the FTC if you meet the eligibility requirements for Roth contributions. 2017 Amounts converted from pound sterling to US$. Earned wages and severance package $111,000. Paid $44,000 British tax. Was in Britain for 219 days. No other income earned. Which form should be used? My wife and I moved to the UAE in May 2018 and rolled a 401K into an IRA, to which I have made no direct contributions. Can I still contribute the $5500 limit by tax day in 2019 toward 2018? My wife worked in China last year and was paid in Chinese Yuan. Based on her tax records, it appears the income tax rate is a lot higher than that of the U.S. Which exchange rate should I use to translate her earning and tax to USD, the last day of 2018? And should choose the exclusion over the credit in this case? You should use the yearly average exchange rate. You can find the exchange rate on IRS’ website https://www.irs.gov/individuals/international-taxpayers/yearly-average-currency-exchange-rates. It is better to use the Foreign Tax Credi as the unused tax credit you can carry forward for the next 10 years. Thank you very much for the quick response!! I Moved in september 2018, and I worked there till then. I sold the house, send some money over to europe and moved. So, in nobemer i found a job here in europe and i already pay the taxes here for the income eran here in nobemember and december. So I wont qualify for the physical presence test till august 2019. Should I go this year for the foreign tax credit in 2018 for those two last months? If so can you referme to another link to do it step by step? Please, refer to our blog post here on how to file Form 1116 to claim Foreign Tax Credit as a U.S. citizen living abroad. We provided step-by-step explanation. Hope it helps! Thanks for your prompt response. Should I go for the form 1116 instead of FEIE since I have to fill 1040 this year and it’s a small amount 6000$? i filed FEIE the last couple of years. Now i´m looking into FTC. Do i automaticly revoke my FEIE by filing a FTC or how would that work? It’s revoked automatically but bear in mind that you won’t be able to use the FEIE for the next 5 years if revoked. Thank you for your response. We live and will stay in Germany for good. The taxes here are higer and we have a child. Since i will stay under 100k and be able to carry over i should be fine. The Child Tax Credit is making the FTC interesting to me. Married to a German. Thanks you for your Blog. Hi OLIVER , i was working in canada 2018 only 3 months and i made 17500c$ and i paid 3700c$ tax in canada. please let me know which form i want to fill out for tax return in USA 2018 tax return for foreign income. Hello. “Basic” question: In 2018 I had both U.S. earned income (from self-employment) and foreign earned income (earned as an employee outside the U.S.). If I choose not to use the FEIE (I would qualify for the physical presence test next July) and instead use the FTC for the foreign taxes I paid in 2018, do I include the non-excluded foreign income on Form 1040 and figure my tax on that income before taking the credit? If so, where do I report the foreign earned income? I will need to use Form 1116 for the FTC, and Form SE for the U.S. self-employment income. What other forms or schedules or worksheets do I need to use? Oh, I also will need to file Schedule D.
Repeating the core part of my question: Do I include the non-excluded foreign income on Form 1040 and figure my tax on that income before taking the foreign tax credit? Really could use some guidance here, Thanks! You will need to report all your income on Form 1040. 1116 worksheet will help you calculate the FTC. You need to prorate the foreign tax paid and cannot use the FT paid on the excluded part of your income. I’ve been living in Japan for a few years now and have decided to contribute to an IRA. For the past few years, I used the FEIE, but I heard there were issues with using any exempt funds for an IRA. Would using the FTC be better? Foreign Earned Income Exclusion specifically disallows contributions to IRA. We have a blog post about IRAs for US expats here. After not going for the FEIE. What are the consequences of choosing one of this options? – If you choose the deductions, you must itemize them on Form 1040, Schedule A. – If you choose the Foreign Tax Credit, you need to complete IRS Form 1116 and attach it to your 1040 or 1040NR Form. I found that if you claim the exclusion it may affect the amount of a Roth IRA that can be claimed. Indeed, you cannot make any contributions to ROTH IRA if you exclude taxable income using the FEIE. Can you explain the equation used when excluding the FEIE from the FTC? The instructions are somewhat unclear and seem to indicate including the housing deduction in both the numerator and denominator of the equation. If you want to fill out the form 1116 and attach it to 1040. Do you have to fill out the Form 1040, Line 7 (if entered in the Foreign Employer’s Compensation Amount field)???? Yes, you’d need to do it. I am a US citizen making $ in the USA. My wife is German making Euros in Germany (Resident alien, but resides all year overseas). When working the FEIE, my tax goes way up when entering her income. When removing her income (about $35,000) using FEIE the income goes back down but the tax I owe stays up. Shouldn’t the tax go back down as if nothing was entered since all foreign income was removed? This looks like I am paying taxes on her income even though her income was removed. She does pay foreign taxes, so this seems like double taxation. It seems you are using a software to calculate your tax. As we are unfamiliar with a program you are using, we can’t help you now. Thank you for responding quickly, and sorry I was not thorough. I am using turbotax on this. I am doing my son’s 2018 taxes. He is a tax resident of the UK. Salary >300,000. He files Form 1116 – FTC. He is an international attorney and travels extensively for work. We understand how to file two Form 1116’s for his “treaty-resourced” US work days and for his non-US “general income” days. Is he subject to taxes in the other countries that he travels to? He would be there for perhaps a week at a time. He travels especially to Sweden, Finland, and China. Thanks! No, your son won’t need to file in countries he travels to. I worked for two companies in Germany last year. I was in Germany the whole year. I was also a full- time student and receiving scholarship money from my US university. I am not sure how to file my taxes this year in the US as I had income in both countries? Being a full-time students my parents are also claiming me as a dependent. If your gross income was $4,050 or more, you usually cannot be claimed as a dependent unless you are a qualifying child. Your earned income was over $6,300. Your earned income (up to $5,950) plus $350. Thank you but this did not help me ….I received scholarship money in the US and worked in Germany. On my US taxes, do I do the foreign income exclusion for my income in Germany? When you use FEIE you can exclude the foreign earned income only. My son is a US citizen and lives abroad. In 2018 he earned just over $3,000 USD. He has 3 children who are all US citizens with Social Security numbers. Can he file US taxes and take the Foreign Tax credit , and still file for the Additional Child Tax Credit. This would be a refund more than he owes in taxes, right ? Your son won’t qualify for Additional Child Tax Credit. He would need more earned income. His personal exemption will eliminate all taxable income. Unless he’s self employed or has more than $1,500 of investment income, he doesn’t need to file a US tax return. Thank you. This year he will be earning a normal salary. How much more earned income will he need? Can he use his wife’s earned income for 2018 (she is not a US citizen)? I really appreciate your help and knowledge. He must make more than $2,500 and 15% of earned income above $2,500 will be the additional child tax credit up to $2,000 or $1,400 if he will have a refund. This is a great summary. Thank you. If I have foreign wages that are more than $102,300, let’s say total foreign wages are $122,300 (all from one employer), can you use the FEIE for $102,300, and then the FTC for the portion of foreign taxes paid on the additional $20,000? If so, assuming I paid 30% foreign taxes in total on the $122,300, can I claim a FTC of 30%x$20,000 for the part over the limit for FEIE? You have to prorate the amount evenly and use the amount paid attributable to the $20,000 for the FTC. I have two W2s from US employers (I’m 100% remote), and 1099 income from companies in CA and FL, and the IRS website says I qualify for the FEIC. (My total annual income is below the threshold.) Would I be eligible for a refund for the state/ federal income taxes that were withheld in the first part of 2018? Do I still need to plan to pay US taxes if I’m not living in or working in the US, based on the FEIC? 1) Yes, you will be eligible for a refund. 2) No, you don’t need to pay US taxes if the income stays the same. Feel free to email us info @ 1040abroad.com to have a free email consultation with my team of tax experts. Great site, thank you! Just clarifying that if the FTC is used in 2016 for the 1st time with an amended return, and you have never used the FEIE before, you can elect to use FEIE in 2017 for an amended return and with filing for 2018. Yes, but once you revoke the FEIE, you cannot use it for another 5 years. I have a bit of an unusual situation – I owe taxes on less than $500 reported in the US in 2018 (my previous job sent me a check in January 2018, months after I had quit and already left the US), I have lived outside the US for over 330 full days in the last 12 months, am a legal resident of France (although I also still qualify as a resident of my state in the US as well), but do not have any foreign-sourced income to report from 2018. My spouse is a French citizen and we are taxed jointly in France. While I obviously plan to file state and federal taxes for the small amount of US income reported in 2018, do I need to fill out any FEIE, FTC, or other such forms to indicate my presence abroad, despite not having any foreign-earned income of my own to report from 2018? Or, since my spouse and I are taxed as a couple by our country of residence, does that mean I should submit the FTC (or FEIE) forms so as to report our joint income? I had originally thought that because my spouse is not, nor has ever been, a US citizen or resident, their income (which is under 25,000€) would not count as taxable joint income as far as the US is concerned – but I just want to be sure. 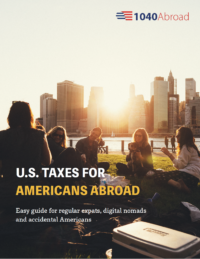 I’ve been getting so much contradictory information – I have a feeling I’m over-complicating things, when all I probably have to do is just file my US taxes by the June 15th deadline for US citizens living and working abroad. Any help would be much appreciated! Thanks! Replied to you via email. Please, check your inbox. My wife and I moved from the US to the UK in January 2017, and are still here. When filing last year I used the FEIE, but was wondering if it made more sense to use the FTC this year? We can pass the bona fide test.